Successfully Added LED iPhone 6/6s Case - Pirate Theme, 5 LEd lights, Call Notification, Free APP, 300mAh Battery, 10 Hours Usage Time to your Shopping Cart. Specially designed for your 4.7 inch iPhone 6 this colorful LED case brings more than just great protection. Download the “Magicool” iPhone app and enjoy a range of controls allowing you to play with the LED lighting effects to best suite you. If Jack Sparrow had an phone this would surely be the case he would use. 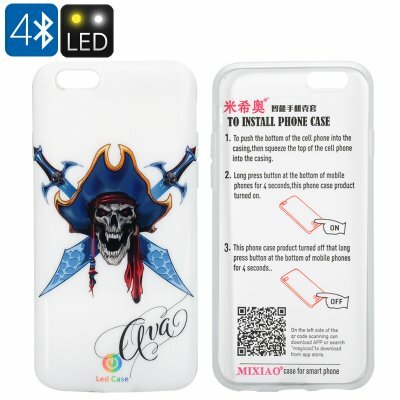 The case features a ferocious looking skull wearing a pirate’s hat with swashbuckling sabers crossed behind it, perfect for the pirate in you.